Our project investigated California’s sustainability initiatives and goals with a focus on renewable energy, and how the energy efficiency and transition should be achieved while maximizing social and economic benefits. Specifically, we looked at the economic and social viability of realizing energy transition goals with an “increase to 50 percent the electricity derived from renewable energy sources by 2030”, which is proposed in Senate Bill 350: Clean Energy and Pollution Reduction Act (de León, Chapter 547, Statutes of 2015) (SB 350). Initially, our project will analyze the rationality and impacts of the transition goal. Alternative policies for achieving the goal was proposed and analyzed in terms of impacts on social welfare, city resilience, environmental conservation, and economic development. Based on the analysis, policy recommendation and enacting strategy was finalized. Over the last 50 years, the global temperature has been constantly rising as a result of global warming. The greenhouse effect occurs when carbon dioxide, pollutants and greenhouse gases absorb solar radiation, causing temperatures to rise. In the US, burning fossil fuels that generate electricity are the largest source of heat-trapping pollution, producing about two billions tons of carbon dioxide every year. How can California shift to renewable energy while maximizing social, economic and environmental benefits? How will the goal of “increase to 50 percent the electricity derived from renewable energy sources by 2030” contribute to social, economic and environmental benefits? The damages of global warming are irreversible and the impact on society is critical; coastal cities inundate, temperatures rise, ice sheet shrink, diseases spread, glaciers melt, species decrease, ocean acidify, sea levels rise are just some extreme effects among many other. This generates an economic, social and environmental cost to the cities and people, in both the present and future. According to NASA, the proposed solution needs mitigation and adaptation. This means reducing carbon emissions and creating alternative solutions for future climates that can help reduce vulnerability. One of the mitigation methods is by introducing renewable energy which is naturally replenished, like that derived from solar, wind, geothermal hydroelectric action. The cost-competitiveness of renewable power generation technologies has reached historic levels. Biomass for power, hydropower, geothermal and onshore wind can all now provide electricity competitively compared to fossil fuel-fired power generation. Most impressively, the levelised cost of electricity (LCOE)1 of solar PV has halved between 2010 and 2014, so that solar photovoltaics (PV) is also increasingly competitive at the utility scale. California has set the goal for retail sellers and publicly owned utilities to produce 50% of the state’s electricity from renewable sources by 2030, which increases the energy burden to low-income families due to high electricity cost. California government should reconstruct subsidies for introducing smart grids at the community level for distributing cost-efficient energy to low-income families. How should California address energy poverty while shifting to renewable energy? As of 2016, California has the highest poverty rate. Notably ranked lower by 7% in previous years by the US Census Bureau, this comparatively higher ranking of poverty in California relative to other states draws attention to the quality of life provided as well as the services in place. California has developed their own index to measure the comparative poverty of their residents. In order to better cater to state-specific sensitivity, the Public Policy Institute of California and the Stanford University Center of Poverty and Inequality developed the California Poverty Measure designed to weigh the effectiveness of welfare safety nets in place. According to their specific metric, four out of ten Californians live in or near poverty, and two-fifths are considered poor. In particular, California’s Energy Action Plan implemented in 2003 served to be extremely effective in increasing energy efficiency. Part of the initiative provided allowed qualifying families to have subsidized insulation and lighting improvements. California is the most populated state in the nation, and, with the largest economy, its total energy demand is second only to Texas. Meanwhile, California is leading the nation in electricity generation from renewable resources, including solar, wind, geothermal, and biomass resources. California has one of the lowest per capita total energy consumption levels in the country. This puts California ahead as the lead in green energy. California’s poor are strongly affected by the cost. "Ggreen policies” are not free from social and economic cost. According to the energy information administration , California has experienced one of the highest average electricity prices, which comes to a total of 17.6 cents per Kilowatthour, much higher than the US nationwide average of 10.98 cents. The high electricity prices have risen as a result of the state’s renewable-energy mandates and carbon cap-and- trade program, and will likely continue to rise at an even faster rate in coming years. In 2012, nearly 1 million California households are facing “energy poverty” -- defined as energy expenditures exceeds 10 percent of household income. In certain California counties, the rate of energy poverty was as high as 15 percent of all households. We want to help people by lowering utility costs or introducing a more efficient energy source. Among many concerns of access to basic resources, energy burden disproportionately affects the poor. According to Professor Hernandez, energy burden “is reflective of the disproportionate allocation of financial resources among low-income households on energy expenditures”. One of the largest household expense differences between higher-income and poor families are the ratio of expenditure on energy and gas to total household income, spending up to twenty percent. Currently, a series of programs including Low-Income Home Energy Assistance Program (HILEAP), California Alternate Rates for Energy (CARE) and Family Electric Rate Assistance Program (FERA) have been operated to mitigate energy burden of low-income household. However, an increasing electricity price resulting from California’s energy policy may make the problem harder to solve. 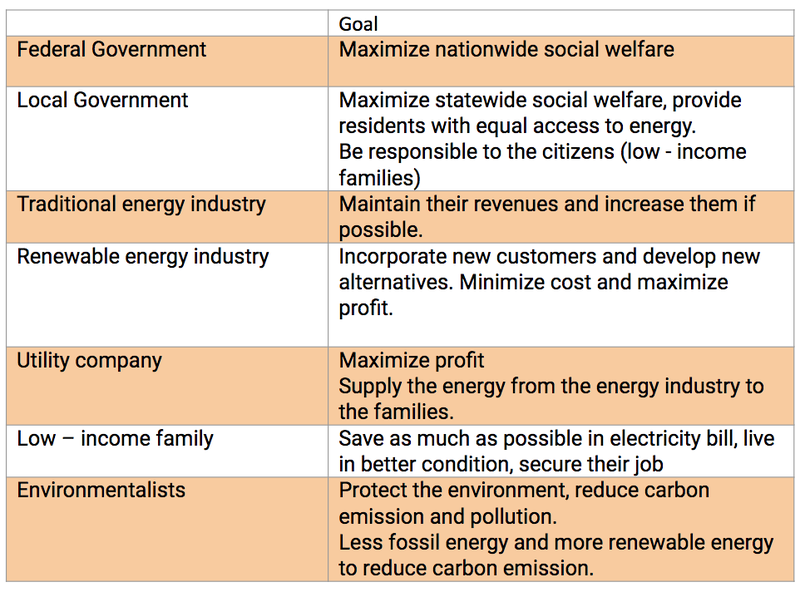 According to our analysis, “Restructure Subsidy” is the best option for most stakeholders, except for environmentalist, who prefer to increase subsidy and impose carbon tax most, and traditional energy industry, who prefer to reduce subsidies. Besides, we also find that California has a really good status quo, which performance acceptable in most aspects. Based on our alternative analysis, we recommend restructuring subsidies to target low-income household, including subsidizing at the community-level to develop smart grids and expanding renewable energy for public facility, which every residents have equal access. According to NBC, Los Angeles (L.A.) is the county with the largest amount of homeless in the US, followed by New York. Only 25% of the total of 55,188 in L.A. are sheltered. The total number of homeless people in California by 2017 is about 118,000 people. These people are not taken into account when we talk about low-income families and are not target in our study as part of the energy poverty. Our research focuses primarily on improving the conditions of the population that already have a house, although some aspects of public goods are used for the entire community. There has to be a more sensitive care for incorporating homeless people in having access to efficient and renewable energy as well. Other aspects of this poverty are the environmental inequality, where pollution and harmful materials end up in low-income neighborhoods or race-minorities communities. Environmental inequality is directly related to energy poverty; a broader analysis could incorporate the relationship between direct contamination and energy poverty in low-income communities in California. One of the main difficulties for this study is the gathering of accurate and shared data. Since we base our work on projections of future scenarios and the sources come from different stakeholders, the decision to incorporate the most reliable source was always in debate. Our proposed alternatives pose a central challenge. Recently, there has been sharp opposition from some groups against the introduction of smart meters. The main argument concerns health, safety, and privacy. The health concerns are based on the fact that radioactive exposure can affect health conditions. Smart meters possesses the same amount of radioactivity as a microwave or cellphone. Regarding privacy, there is a concern on how much information can be transferred and used with this. Regulating and establishing the limits of privacy and security would have to be reinforced and target in the implementation part. Lastly, the transportation sector was not considered as part of the alternative. The transportation sector takes 37% of the GHG emission and around 13% of the portion of low-income families’ expenditure. There is no recent information about this data, and we acknowledge that incorporating transportation into the discussion could be a compelling perspective. As shown above, we have a renewable energy oversupply and curtail problem. In first quarter in 2017, about 3% of the total potential solar and wind generation was curtailed. This amount is expected to increase, which results in expensive renewable energy cost. On the other hand, all low-income families who are suffering from energy burden are not necessarily covered by the government’s program for low-income family. Those people are isolated from the society and the government should save them. Introducing Smart Grid in a community level can become a solution. If people need to cooperate with community members to apply for the government subsidies, they should care others including low-income families. It is possible that the government use the current budget for subsidy which cannot reach to eligible low-income families for the alternative 1. As a result, Landowners should consider their renters who cannot afford to the current programs such as energy efficiency increase. One promising way is to encourage to introduce an advanced storage system which helps to reduce curtail and promote efficient electric usage. According to “California Smart Grid Annual Report to the Govern and the Legislature”, two of the three IOUs reported they made a benefit by introducing Smart Grid. Even though there remains some divergence on how the IOUs represent environmental and customer benefits in monetary terms, it is clear that they think Smart Grid is an effective tool to enhance their productivity. From this viewpoint, utility companies, environmentalists, and the government must support the alternative 1, and low-income families who would receive cheaper electricity cost benefits might support it. U.S. Department of Energy awarded California for its self-funded public facility retrofit programs in 2013 through State Energy Program (SEP). The award aim to assist states in driving demand for public facility retrofit programs with a focus on increasing uptake in three key sectors -- local government facility, public housing, and state facilities. First, with the financial support from DOE, California should first conduct facility retrofit in the above-mentioned sector and facilities that DOE provided retrofit guideline, like K-12 schools and healthcare facilities. Then California could expand to a wider range of public facilities, for instance, street lights. One solar powered LED light saves 550kWh electricity per year. Based on the current average electricity price, 0.177/KWH, it saves $97.35/Yr/light, meaning $140,000 per 100 km. This saves taxpayers nearly 50% of the street light bill. At the end, public facility should aim to become Net-Zero Energy. SB 100 of pushing 100% renewable energy failed this year, however, public facility could have the chance to lead the transition to 100% green. All residents in California would benefit from the transition and upgraded public facility.